“Think of the one place you’ve always wanted to see” says the Beast to Belle, as he shows her a magic book of the world in his incredible library – and off they go to plague-ridden Paris, which wouldn’t be my choice for a free holiday of a lifetime with a gazillionaire prince, especially an ugly one, but there you go. But Belle, an outsider as much as the Beast is, has been struggling to make sense of her past, and needs to find out about the death of her mother in France’s capital when Belle was a baby. Every girl has probably felt like an outsider at some point, whether they are seen (like Belle) as the bookish one, or the goth one or the girlie one. In that sense the heroine of Beauty And The Beast is all of us, though she is resolute enough to continue looking for someone who will let her be herself, rather than change to fit in. I’ve never seen the 1991 animated version of Beauty And The Beast which apparently makes me as weird as bibliophile Belle – but it came out when I was 20 by which time I was more into Stone Roses than enchanted ones. I knew some of the songs from that sort of cultural epigenetics where knowledge of musicals and films and books seems to seep into our collective DNA, and I knew the basic story as I was brought up on ancient fairy tales read from the dusty cracked pages of old tomes stuck together with Rapunzel’s tears (ok, Ladybird Books) but I can’t compare it to the original in any detail. We all know this tale though. Motherless Belle (a rather captivating Emma Watson) is a bookish young woman in a village filled with people of a more practical bent, shall we say. Bored with small town life, she retains her sanity by borrowing novels and Shakespeare from her neighbour Père Robert (“your library makes our small corner of the world seem big” she tells him), but she is seen as an oddity. Gaston (Luke Evans) is desperate to marry Belle but she is repulsed by his vanity and narcissism which he takes to new heights: constantly looking in mirrors; belittling the village girls who adore him; creepily unable to accept that the idea of being with him makes Belle shudder. His sidekick LeFou (Josh Gad) supports and advises Gaston but gets little thanks. Belle’s father (Kevin Kline) is an inventor who makes musical boxes, and it is when he is away selling his wares that he comes upon the enchanted castle. Taking a rose from the garden for his daughter, he is captured by the Beast, labelled a common thief and locked away. When Belle comes to rescue him she tricks her father into allowing her to stay in his place, and he returns heartbroken to the village where he tries to summon help. Gaston’s assistance at this point is of course a double-edged sword. The castle servants, who, since their bewitchment, now resemble counters from an 18th century version of Cleudo, are clearly a tight unit. Lumiere the candelabra has a cheerily insulting relationship with the rather curmudgeonly majordomo/clock, Cogsworth (Ian McKellen): “A broken clock is right two times a day, Cogsworth. But this is not one of those times” he states during an important moment. Plumette (Gugu Mbatha-Raw), Lumiere’s feather-duster girlfriend, is lovely and she and Lumiere are prone to frequent PDAs. 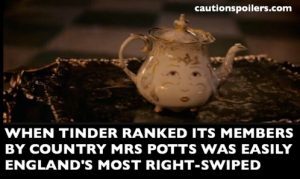 Mrs Potts the teapot (Emma Thompson) and her teacup son Chip are typically English. Madame De Garderobe (Audra McDonald) is fabulously over the top, madly dressing Belle in so many stiff petticoats and layers that when she climbs out in irritation the dress is left standing behind her. Sadly the servants feel themselves becoming more inanimate and less human as the enchanted rose’s petals slowly fall – Plumette grows several new feathers despite plucking daily, and Lumiere feels more metallic. Gradually Belle and the Beast spend more time together… but will she say the L word (no not Lumos, Belle is the one without magic here) and break the spell? The initial switch from the two being at loggerheads to falling in love is rather clumsily handled – suddenly Belle and the Beast are reading books together and going for snowy walks. They even up the ante with a snowball fight, the 18th century version of Twister for getting close to someone you fancy. Despite the clunkiness of their blossoming relationship, Belle’s admission – when the Beast wearily points out how laughter-filled rooms fall suddenly silent when he walks in – that the same thing happens to her in the village, is very sweet. They really are two misfits who have stumbled upon each other. This is quite a feminist retelling of the age-old story, and frankly with Belle trapped in a pincer grip between a kidnapper and a stalker it needs to be. I had heard about Belle’s invention of a washing machine (involving a horse wheel and a pond, don’t expect a 7kg-load Hotpoint) so she has more time to read, which I didn’t think was that feminist as – and hang on while I go and put a load in the dryer, ok I’m back now – she is still in charge of the laundry. But there are more feminist nuggets scattered through the script which are (worryingly!) unexpected – when Gaston asks if he can join Belle for dinner she says no, and when he presses her about what she’s doing, instead of making an excuse she simply says she’s doing nothing, a surprisingly rare response as women are trained to spare people’s feelings, even people like Gaston. The opening scene with a ballroom full of dancing debutantes in cream, white and gold, all with beautifully powdered wigs, is ravishing to look at, and with a film like Beauty And The Beast where the story is so well known, a lot of its appeal is based on the songs and the look. Belle is prettily natural – Emma Watson is one of those women who are more beautiful the longer you look at them. The Beast is quite scary-looking (in fact he mostly resembles Krampus, the anti-Christmas anti-hero who haunts the dreams of Santa Clauses everywhere). Performance-wise Emma Watson is believably stubborn and brave, but lonely and a little scared underneath. Dan Stevens is good as the alternately angry and grumpy beast although for a long time he’s such a misery it’s quite amazing that any woman would even bother trying to get to know him. Gaston probably has more screen time than the Beast, and despite his character’s unredeemed awfulness Luke Evans manages to keep him just the right side of pantomime villain and with more than an edge of menace. But can they sing? Watson doesn’t have a particularly powerful set of lungs on her but she sings sweetly. Ewan McGregor as Lumiere sings his big musical number in an accent that veers between Scottish, English and French. By far and away the best singer is Madame De Garderobe who is simply amazing. Whenever she sings she shows up everyone else’s weaker voices. I could have listened to her all day. There are a few new songs, including Evermore, sung by the Beast and showing Dan Stevens can belt it out when required. Sadly what holds back Beauty And The Beast is its unevenness. It’s too long at 2 hours 10 minutes, and peaks and troughs throughout its running time. The good bits (the initial ballroom scene, Belle’s opening number as she wanders through the village, lupine chases through snowy forests, Belle’s dancing scene with the Beast) are dazzling, charming, exciting and moving. The bad bits (Gaston’s rather underwhelming tavern song, Belle and the Beast stropping about at the beginning to name two) are dull and sluggish. Luckily the last half hour – where the house and furniture fight back against intruders and the Beast fights Gaston – really picks up both speed and tension, and while we all know what the ending will be (is it even possible to spoiler a fairytale? ), getting there is, in the main, rather a joy.